The 35,000 sq. ft. building celebrates three artisanal crafts significant in Bulgaria: textiles, wood carving, and glazed ceramics. 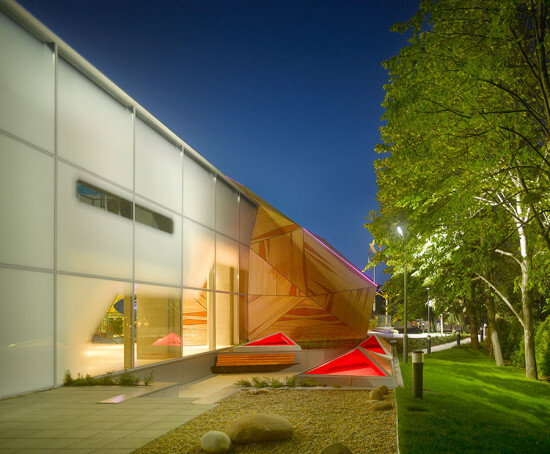 Lee H. Skolnick Architecture and Design Partnership has designed a new children’s museum called "Muzeiko" in Bulgaria’s capital city of Sofia to balance complex form, regional relevance, and whimsical fun. Their client, the America for Bulgaria Foundation, wanted international expertise paired with state of the art materials. The architects responded to the geography of the Sofia Valley, a region surrounded by mountain ranges, with abstracted forms referring to the nearby Balkan mountains, triangulated in a "scientific" manner. This thematic element, coined “Little Mountains” by the architect, is composed of a rainscreen assembly consisting of high pressure laminate (HPL) panels with printed graphics clipped onto a wall system framed by a combination of a primary steel framework, and a fiber reinforced concrete shell. The panels are differentiated with color and patterns unique to traditional artisanal Bulgarian crafts. Textiles and embroidery, wood carving, and glazed ceramics were studied by the architects, and reduced into three color-saturated patterns which were ultimately applied to three forms. Another feature of the building is a “super insulated” curtain wall assembly of triple glazed low-e glass, custom built locally by TAL Engineering. The glass panels were some of the largest available in the region at the time, sized at 7’-4” x 10’-10.” A custom ceramic frit pattern, developed by the architects, creates a “cloud-like” effect while establishing view control and addressing solar gain concerns on the south facade. The curtain wall extends beyond the roof to form a parapet guard at the roof deck, where the frit pattern dissolves enough to catch a glimpse of the sky beyond the facade from ground level. Also notable is a custom gray coloration on the mullions, which is the result of numerous mockups studying the least visually distracting color to the overall system. Beyond the curtain wall assembly, notable sustainable features include solar panel array on the south wing, recycled grey water for irrigation, and interpretive sustainable features on display throughout the interior of the building. A key precedent for the project is the University of Mexico City, says Lee Skolnick, FAIA, Principal of LHSA+DP, which has an “incredible facade of mosaic tile.” Skolnick says the project was an attempt at the time to marry modern architecture with cultural significance. "It’s a concept that has been used rarely throughout recent architecture history. 'Interpretive content' on the face of the building is coming back, but it is not universal. We much more often see patterning that is geometric or structural — a geometric blanket that wraps a form. We are looking for something that is more highly specific than that.” At key moments along the building envelope, the colorful “little mountain” forms visually penetrate beyond the curtain wall system into the interior, establishing specialized programmatic spaces such as a gift shop, cafe, eating area, restrooms, and multipurpose workshops. One challenge the design team faced was developing a patterning for the rainscreen panels. They began by considering a variety of materials and fabrication methods available, from ceramic materials, to fabrics, to etched metal panels. Ultimately the architects chose a high pressure laminate (HPL) material for maintenance, manufacturing quality and consistency, detailing control, and lifespan of material. Through a process of "continual sampling, processing, and refining," the architects arrived at a set of patterns which boldy abstract the colors, patterns, and textures of Bulgarian artistry. The lower level of the New York Historical Society was lively last Friday morning at the ribbon cutting for the new DiMenna Children’s History Museum and the Barbara K. Lipman Children’s History Library. Young New Yorkers were trying out a number of new, interactive activities in the vibrant 4,000 square-foot vaulted space. Pavilions divide the space into various programs including biographical information on figures such as Alexander Hamilton and James McCune Smith, viewing changing New York sites throughout history. In the library, children will also have access to rare books and maps from the Society’s collection. The Children’s History Museum has been in the works for three to four years as part of the Historical Society’s $65 million renovation. 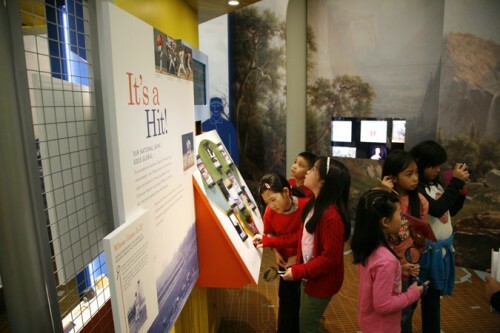 Architects from Lee H. Skolnick Architecture and Design Partnership worked closely with museum curators to design a permanent exhibit dedicated to educating children on history. Lee Skolnick, the principal architect of the firm, has extensive design experience, spanning thirty years, on children’s museums. But here, Peter Hyde, associate and senior exhibit designer, distinguished, “We have done history museums and children’s museums, but never a children’s history museum.” The overall concept of the exhibit presented various challenges for curators as well as the architects: how to convey historical events to children in an exciting and engaging way. 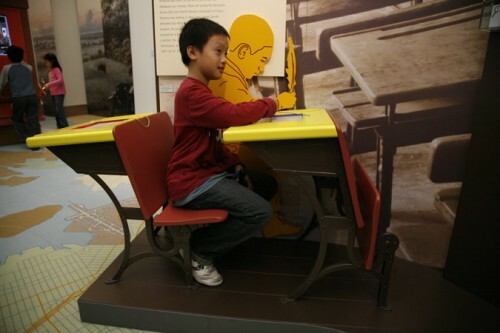 The design of the space along with its content intends to relate New York kids to history by exploring famous as well as everyday historical figures as children.